Saturday - January 3, 2015: Linda and I checked out Lemongrass Thai Cuisine, which opened 10 months ago in downtown Overland Park. It is an attractive restaurant in a building which was completely remodeled before opening. We tried a wide range of appetizers, bringing a couple of boxes of leftovers home. The service was very good and the food was fine, but no dish really stood out for me. My favorite items were the spring rolls, tempura broccoli and the chicken & pork Paad Thai. The crab Rangoon was made with thick, hard wantons. The tiger ribs had a good flavor, but were very tough. The shrimp in a blanket came with a good spicy/sweet sauce, but the "blanket" lacked flavor and was a little too crisp. Sunday - January 4, 2015: For lunch, I headed back to Overland Park to revisit ABC Cafe, but it turned out to be closed for the holidays until January 7. I continued east to revisit Masalas Authentic Indian Bistro, but discovered that it has closed and a new Indian restaurant is going into the space - Paradise Biryani Pointe. Doing a little research online, it turns out that Paradise Biryani Point is part of a fairly large chain on Indian restaurants. They are primarily in the northeast, but are in 19 states and are opening several new locations, including one in Singapore. For supper we went to Maloneys Sports Bar in downtown Overland Park. 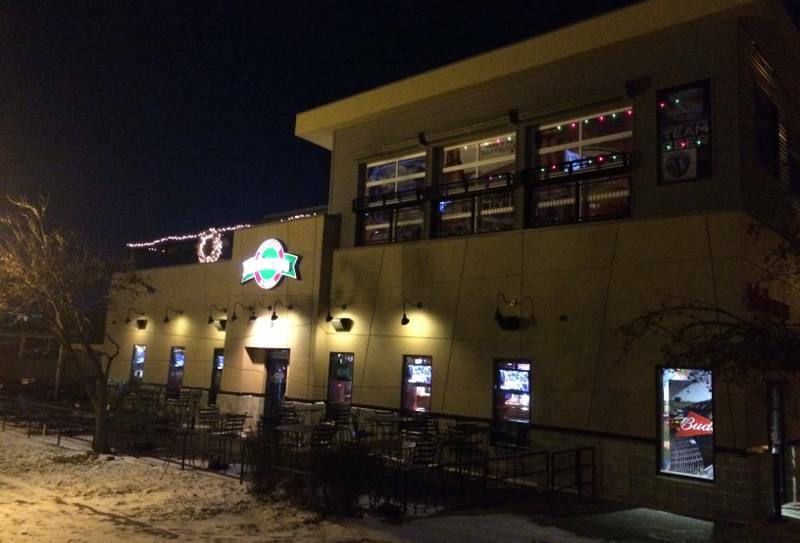 The large bar & grill has town levels with large outdoor seating downstairs and upstairs. There are TVs everywhere. All of them them were tuned to NFL playoffs or Wichita State University basketball, but the sound was loud music. Not painfully loud, but loud enough that a conversation nearly required shouting. The food was mostly average. The fries were inferior, crinkle cut, frozen French fries that were not cooked particularly well. The Triple Crown (Triple cheese roasted garlic sauce with pepperoni, Canadian bacon, jalapenos, red onion, mozzarella and cheddar cheeses) and The Maluban (Thinly sliced smoked ham, roast beef and roasted pork loin topped with melted cheddar and provolone cheese. Served on a hoagie garnished with lettuce, tomatoes, onions and a roasted red pepper aioli.) were both OK, but not nearly as good as they sounded. Thursday - January 8, 2015: We are updating many older pages this week, confirming hours and prices, replacing some photos and adding maps to some attractions which didn't have maps, including: Key Stone Gallery near Scott City, Fort Larned National Historic Site, Heritage Center of Dickinson County in Abilene, Powell Observatory near Louisburg, 1879 Beaumont Hotel in Beaumont, and Red Barn Studio in Lindsborg. Friday - January 9, 2015: After researching Johnson County restaurants which have been off our radar, we tried out the two year old Geo's Pizza in Overland Park. Several people had said online that it was hard to locate, in a strip center near a Pei Wei Asian Diner. 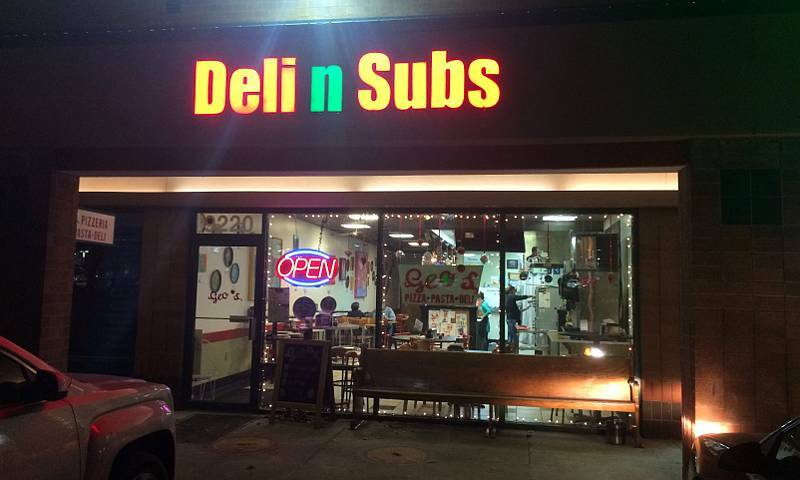 They were right, with a small frontage and the sign saying Deli n Subs, instead of Geo's Pizza. Friday night turned out to be a poor night to go to Geo's Pizza. They don't have very many ovens and when they are busy, they get way behind. It was a bad sign, when a few minutes after we ordered and sat down, we heard a couple complaining that they had been there an hour and still didn't have their pizza. I don't know if they had really been there an hour, but the chef had to tell them that their pizza hadn't even gone in the oven yet and they left. Our pizza took 55 minutes (I checked the time stamps on the photos I took). The thin, cracker crust pizza was fairly good, but not worth that long a wait. 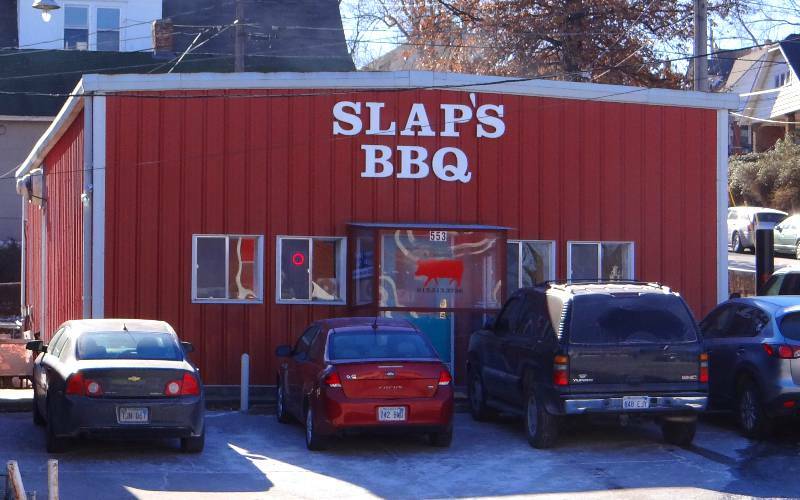 Saturday - January 10, 2015: We have been hearing great things about Slap's BBQ in the Strawberry Hill neighborhood of Kansas City, Kansas since it opened last summer. But is is only open for lunch and the one time we went there, there was along line standing in the rain. Today, I was there within minutes of their 11AM opening time and there were just 4 people waiting in line ahead of me. Better yet, I was able to get a table, something that can be hard to do in the small dining room which has only 6 tables. After a little thought, I ordered the $14.99 burnt ends combo plate, plus two ribs for $4. The combo comes with the choice of two sides and I went with fries and cheesy corn. The meats were served dry (without sauce), and sauce was available in a squeeze bottle on the table. My favorite item, by far was the ribs. They actually gave me three rather small ribs. They were tender and had an excellent slightly smoky flavor that had been well seasoned by rub or marinade. The sausage was also very good. The large chunks of burnt ends were the weakest meat. They tasted good, but were more mildly seasoned than is expected in Kansas City burnt ends. The fries were lightly battered and the only part of the meal which I didn't bother to finish. The cheesy corn need just a touch of salt to be very good. The sauce is the odd thing. Fortunately the meats did not need sauce. It was a thin, very sweet sauce like that found in Chinese or Thai restaurants. While it may have its fans, I believe they could use a second, less sweet sauce. Following the meal, I drove around the block to check on a church with an onion dome toped tower. 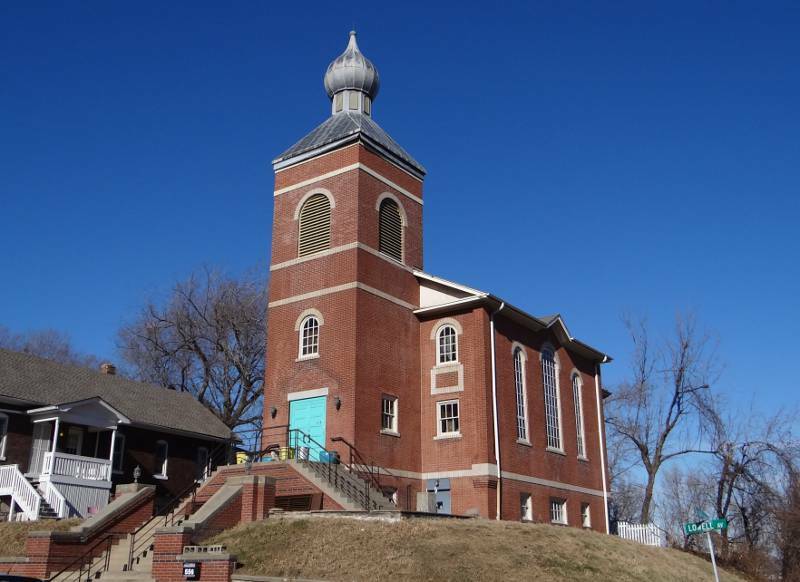 It turned out to have no signage, but searching online this afternoon, it turned out that this former Russian Orthodox church is the studio used by Voler: Thieves Of Flight, the aerial acrobatic trope which looked impressive a few years back at the Busker Festival in Lawrence. After taking new exterior photos of St. John the Baptist Catholic Church and the Strawberry Hill Museum, I bought brats, Italian sausage and smoked Polish sausage at Krizman's House of Sausages. In addition to getting some good meat, it was a good chance to take fresh photos. Krizman's has been listed on our Kansas Specialty Foods page for a long time and is overdue for a page of its own. 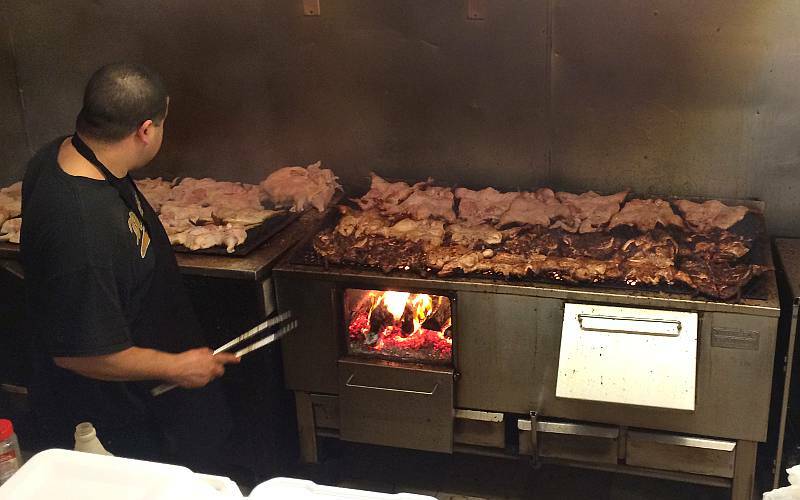 While at Krizman's House of Sausages, I received a recommendation for a restaurant which I had never heard of before, El Pollo Rey in the Armordale neighborhood. Linda joined me in going there tonight and we enjoyed some great chicken in a packed 13 year old restaurant which serves only three dishes: a half chicken, a whole chicken or chicken wings. Served with tortillas, rice, salsa & beans, a meal is $6.50. 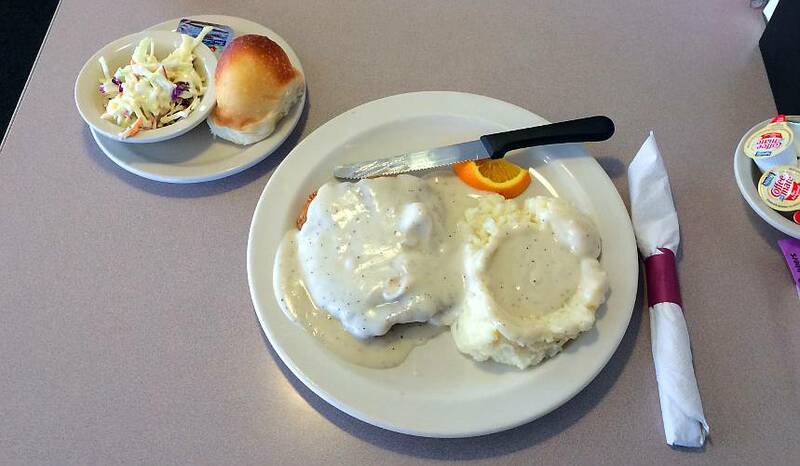 Friday - January 16, 2015: Our visits of previously reviewed restaurants for 2015 updates continued with Old 56 Family Restaurant in Olathe. The country fried steak was excellent, tender with a crunchy breading which combined with the gravy to make each bite a pleasure. The meat portion was a little small - a little less potatoes and a little more steak would be perfect. Saturday - January 17, 2015: I was up early and drove to Milford Nature Center near Junction City. Today was Eagle Days (it was originally 2 days, but the name stayed "days" when it went to one day. The Nature center hosted programs with live eagles and other live raptors, kid's activities & crafts, free admission to Milford State Park, free bus rides to eagle viewing and free popcorn & hot chocolate. 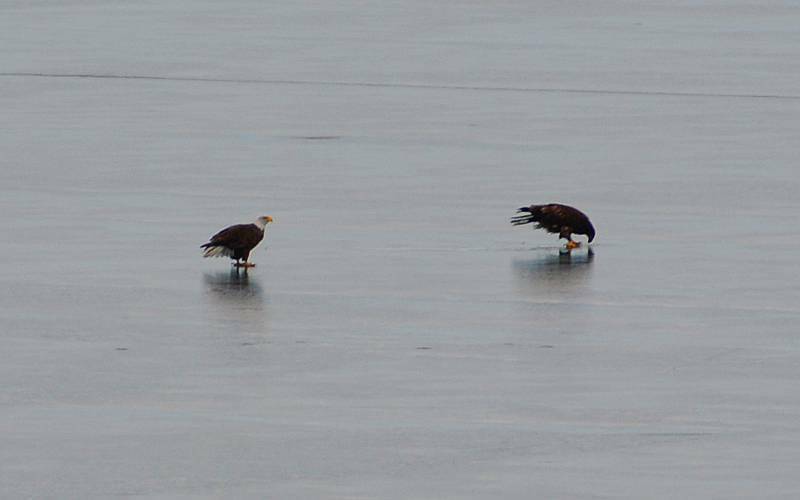 There were many eagles on the ice at Milford Lake, but they were all at great distances. It was not necessary to take a bus to view the eagles, though the bus did take visitors to locations where binoculars and spotting scopes were available to better view the eagles. Photos with my longest lens were nothing special. Returning to Junction City, I had lunch at two Korean Restaurants which have been listed on this web site for many years: Korean Garden and Pusan Diner. At Korean Garden, I had Ojinguh Bokum (stir fried squid in a spicy sauce). It was a little tougher than usual, but very good. Half of it was boxed up to go home with me. I wanted to try something different at Pusan Diner and settled on something which I have never had at a Korean Restaurant, chitterlings stir fry with hot sauce & vegetables. 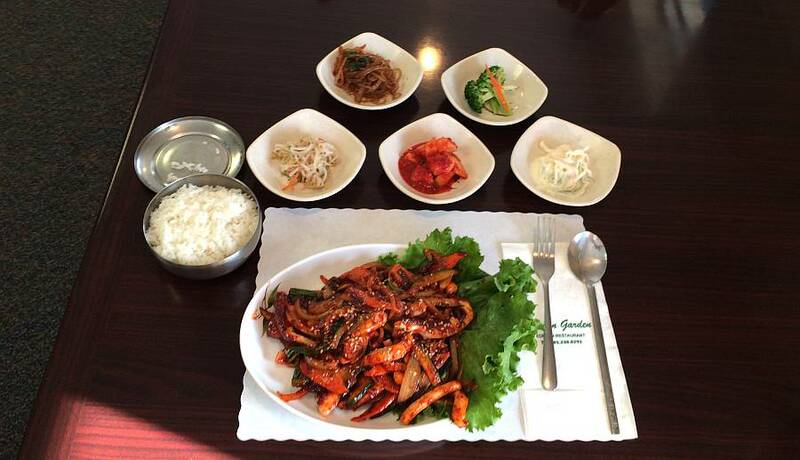 All meals are served in styrofoam boxes as Pusan Diner, even if they are to be eaten at the restaurant. Knives don't do well with Styrofoam and my meal was accompanied by kitchen scissors. The meat was tender, but chewy and while the meal wasn't bad, the meat didn't excite me and it isn't something I would order again. Moving on to Manhattan, I was waiting when the Riley County Historical Museum opened at 2pm. The two displays which I found to be the most interesting were one titled "Made in Riley County" and one on how the museum catalogs, conserves and selects which items to collect. The staff at the Riley County Historical Museum also provides tours of the Kansas Historical Society's Goodnow House, which is next door. The tour of the 1857 stone house and the story of the steamboat Hartford which the docent explained on the way back were the most interesting parts of the visit. On that docent's recommendation, I went on to the Wolf House Museum, a couple of miles away. The interesting two story limestone house was built in 1868 as a boarding house. The final stop of the day was for supper at Bradley's Corner Cafe in Topeka. The chicken fried chicken was OK, but the meal began some very good cheese and potato soup and ended with a fabulous slice of sour cream and raisin pie. 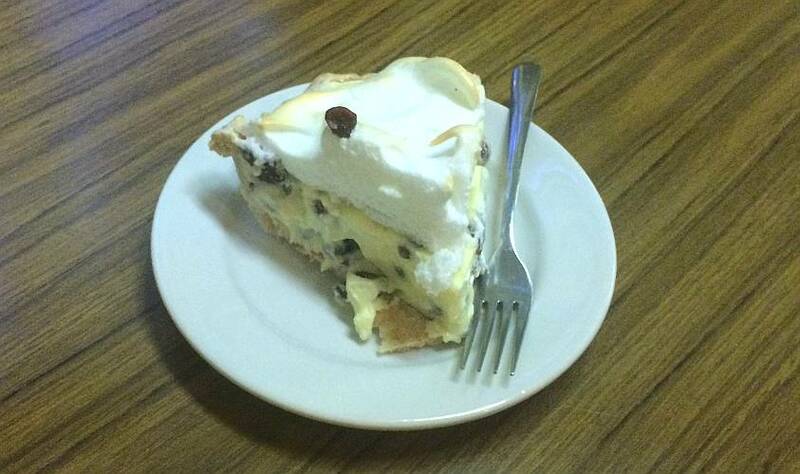 The pie filling was good, the the meringue was OK and the crust was very good, but a bite of all three together was heaven. Sunday - January 18, 2015: Pat, Linda and Mary joined me in an update visit of Dagwood's Cafe in Kansas City, Kansas. The hamburger, fries and biscuits & gravy were OK. The scrambled eggs were nothing special. 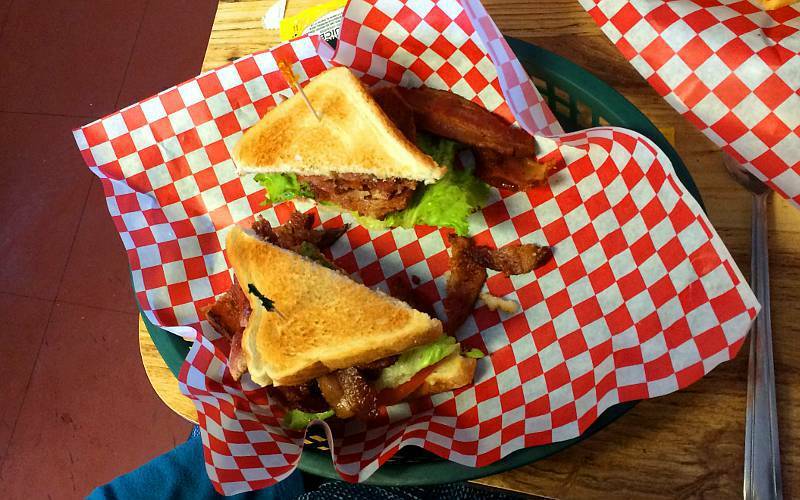 The onion rings were good, but the best part of the meal was the BLT with a half pound of applewood smoked bacon. It is made with the typical amount of toast, lettuce and tomato so the 8 slices of bacon standout, while not making an enormous sandwich overall. New pages devoted to Milford Nature Center and Eagle Days were added to this site. 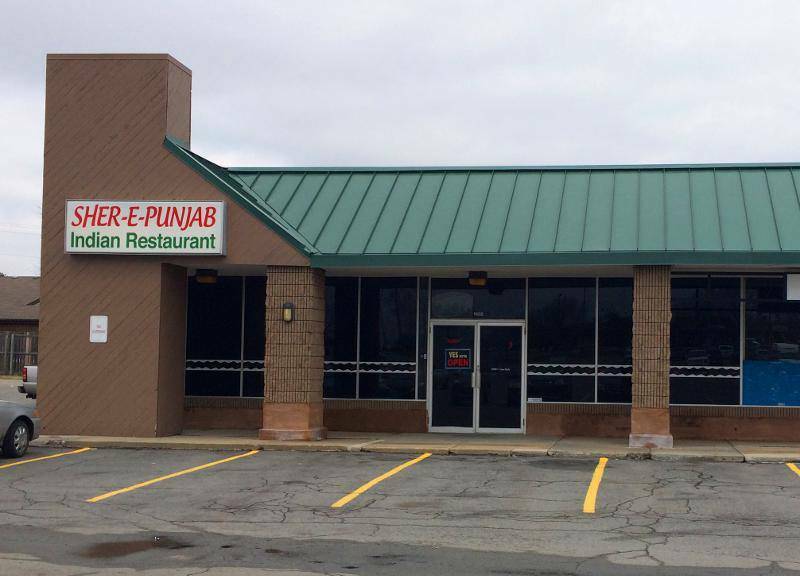 Tuesday - January 20, 2015: I paid a second visit to Sher-E-Punjab, the Indian restaurant which opened in Olathe about a month ago. I haven't enjoyed any of the dishes on the buffet that much, with the nan (flat bread) being the best thing I've sampled. It is time to try ordering off of the menu. I had supper at Winstead's Steakburgers on Metcalf in Overland Park. There were no significant changes from the previous visit a year ago. 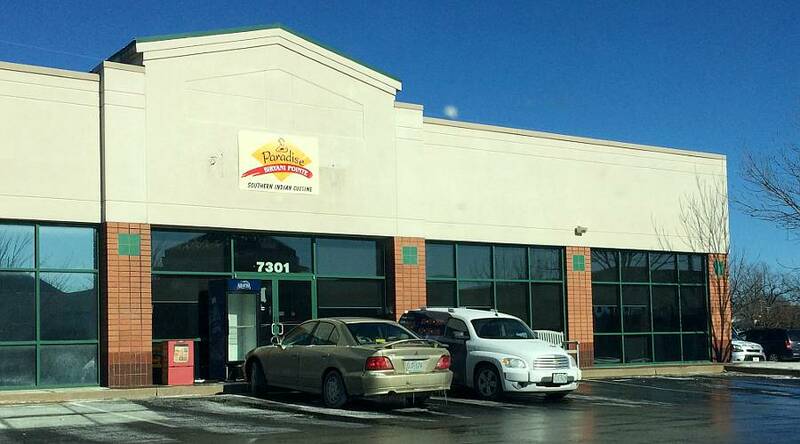 Wednesday - January 21, 2015: Linda and I tried Rice House on 87th Street in Lenexa (in the Hen House parking lot). They are largely a takeout place, but have about 18 tables. On weekdays there is a lunch buffet. The buffet was not very well maintained. Items ran out or had been sitting out for too long. It wasn't terrible and they do not have a lot of nearby competition. The main thing I can say is that it is inexpensive and quick. Supper was a revisit of Wyandot Barbeque 2 in Overland Park. It had been about a year since the last visit and the website has been updated with the new pricing. 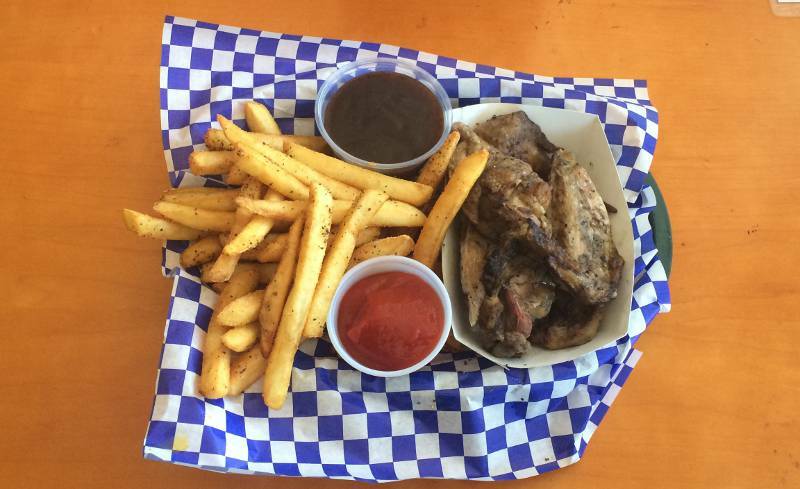 The Mixed plate of beef, ham, ribs and fries is a tremendous bargain at $9.50. I liked all the meats. The fries were only frozen crinkle cut, but subject to that limitation were well prepared. Friday - January 23, 2015: Today's lunch was at the Other Place in Olathe. For a change, I tried the grilled pork tenderloin. I actually enjoyed it much more than their fried pork tenderloin. The hand cut onion rings were nearly as good. Saturday - January 24, 2015: At lunch today, I paid an updating visit to Christy's Tasty Queen in Kansas City, Kansas. I had almost forgotten how good Christy's pork tenderloins are. The large tenderloin sandwich was wonderful with tender pork wrapped in a crispy, great tasting coating. The onion rings were also excellent. Before leaving Kansas City, I did a little wandering on streets where I had not been before. The most interesting find was the Seventh Day Adventists Central States Conference Offices, which are housed in a striking old church building on the former campus of Kansas City University, a Methodist school which operated from 1896 until 1933. In latter research, I learned that the University was indirectly a successor of Lane University which was in Lecompton, Kansas. For supper, Linda joined me for a revisit of Papa Bob's BBQ in Kansas City, Kansas. I added a new review of thie restaurant. Sunday - January 25, 2015: Linda & I drove to Lawrence to revisit the Natural History Museum at the University of Kansas and Aladin's Cafe. It had been several years since the pages devoted to either of these had been updated. Thursday - January 29, 2015: We returned to Big Bam's, a popular small burger joint in Shawnee. We had liked it, but not enough to add it to this website in the past, but it has been getting some strong reviews by the public and I wanted to give it another chance. 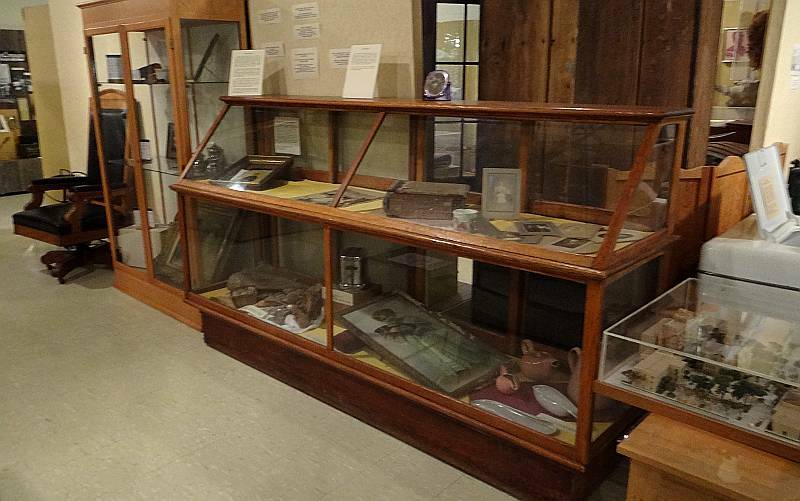 A new page devoted to the Kansas African American Museum in Wichita was added this evening. 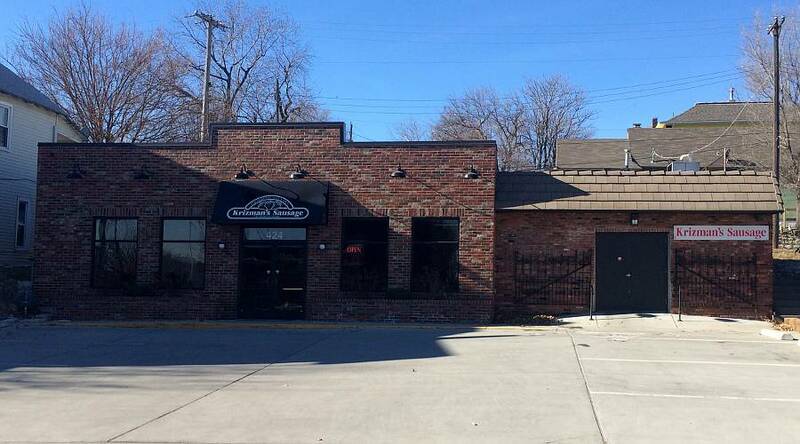 Saturday - January 31, 2015: Now that Grinders Stonewall in Lenexa has been open a half year, today seemed like a good time to pay it a second visit. This is the third location, with the other two being side by side in Kansas City's Crossroads Arts District. Oddly, it still isn't listed on their website. We sampled the New York style pizza and the club sandwich. The pizza, was OK, but the club sandwich which came with house made potato chips was better. After two visits, the sandwiches are the items we have liked the best, but nothing has really stood out. They do have a nice patio and and interesting old (haunted) building. Added a new page devoted to Wagner's Classic Cars in Bonner Springs. This used car sales is worth a visit to see the many classic and muscle cars on its showroom.